On Thurs 7th December 2017, a new password policy will be introduced to the ACW site for all users. In an effort to guarantee that the data held within the ACW database is kept as securely as possible you will be required to change your password. Passwords containing the above characteristics are considered to be strong. All passwords should be reasonably complex and difficult for unauthorised people to guess. Users should choose passwords that are at least twelve characters long and contain a combination of upper and lower case letters, numbers and other special characters. In addition to these requirements, users should also use common sense when choosing passwords. They must avoid basic combinations that are easy to crack. For example “password”, “password1” and “pa$$w0rd” are all equally bad from a security perspective. Users should choose unique passwords for all of their system accounts, with meaning only to the user who chooses it. Contain personal information such as birthdates, addresses, phone numbers or names of family members, pets, friends and fantasy characters. Users should never share their passwords with anyone else in their organisation, including co-workers, managers, admin assistants, IT Staff members etc. Everyone who needs access to the ACW system should be given their own unique password. Users should never share their passwords with any outside parties, including those claiming to be representatives of a business partner with a legitimate need to access the ACW system. Users should refrain from writing down passwords and keeping them at their workstations. If you have any queries relating to this or concerns that your password integrity may be compromised please do not hesitate in contacting the System Support Team or 0300 303 4444. The UK Fashion & Textile Association (UKFT) is to become the Sector Skills Body for the Fashion & Textiles industry. UKFT will take over the management of current Apprenticeship frameworks with the responsibility of both registration and certification of Apprentices in England, Scotland and Wales and work with devolved nation’s stakeholders, to ensure that National Occupational Standards and Apprenticeship provision for the sector are maintained and developed. The transfer of responsibility from Creative Skillset to UKFT goes live on 1st November 2017. UKFT is the most inclusive British network for fashion and textile companies in the UK. We bring together designers, manufacturers, agents and retailers to promote their businesses and our industry, both in the UK and throughout the world. UKFT is in a unique position, representing businesses from spinning, weaving and knitting, right through to catwalk. From the 14th October 2016, Welsh Government will amend the Specifications for Apprenticeship Standards in Wales to allow proxies and alternative qualifications to be accepted in lieu of Essential Skills Wales (ESW) / Essential Skills Qualifications (ESQ) in Communication, and in Application of Number for transferable skills. The modification means that the qualifications like GCSEs, A/AS Levels, Functional Skills, and nation specific qualifications for English and Maths, that were previously excluded, have now been brought into scope for acceptability within SASW frameworks. No proxies or alternatives are currently being accepted for ICT/Digital Literacy. Please note since this involves a statutory process, proxies and alternative qualifications will only be accepted for people commencing their framework on or after the 14th October 2016. This will not apply retrospectively and anyone starting their framework prior to this date must comply with the previous SASW requirements. For further guidance on pre 14/10/16 requirements please click see the Transferable Skills (Starts up to 13th Oct 2016) document. The Federation for Industry Skills and Standards (FISSS) have created an ACW Transferable Skills guidance document in line with these changes, and this can be accessed through the ACW Knowledge Base . 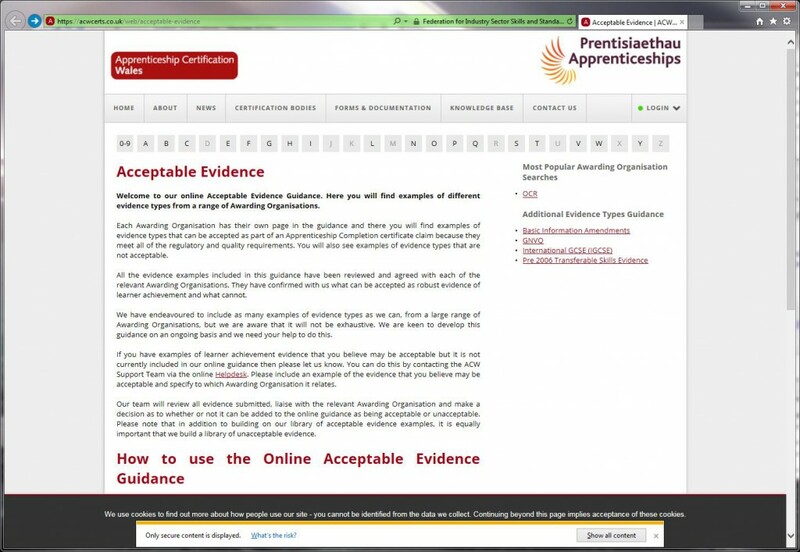 We have also created an Acceptable Evidence guidance tool fully integrated with the ACW website, making it easier to navigate and find individual evidence examples. Please also note that any SASW frameworks issued on or after 14th October 2016 will no longer include ERR as a compulsory element. However, some sectors may decide to retain the requirement for ERR so please check the specific framework document for further details. If you have any further questions relating to this issue then please contact the ACW Support Team via acw@fisss.org or by calling 0300 303 4444. Due to unforeseen circumstances, the Federation have been forced to find new hosting suppliers for our Websites and Online Certification Systems (ACE, ACW and MA Online v2). Unfortunately a delay with our new supplier has meant that the www.acwcerts.co.uk domain has been placed offline temporarily. We are working to get the system back up and running as quickly as possible however ACW may be offline until 10 a.m. tomorrow morning (7th January). You will not be able to view the ACW website or access the system during this time. We apologise for any inconvenience caused and we will keep you all informed of any developments throughout the day. Whilst this current downtime was unexpected, we have essential maintenance scheduled to start at 9a.m on Friday 9th January. You will not be able to access www.acecerts.co.uk, www.acwcerts.co.uk and www.modernapprenticeships.org during this period of maintenance. We anticipate that this will be completed by 9a.m. on Monday 12th January and you will be able to access all websites as normal from this time. We apologise again for the disruption caused by this maintenance and we thank you for your patience. If you have any questions please contact the System Support Team on 0300 303 4444 (option 1, option 1) and acw@fisss.org. • Where ERR is a mandatory requirement in a framework, new declarations regarding its achievement by an Apprentice must be made on the Frameworks Tab before a certification claim can be submitted. • There may be some Apprentice records that get caught in the transition period, for example, if a learner was at Entered or Rejected and did already have ERR evidence uploaded pre 25th Feb 2014 then, after the ACW changes, when they are changed to Pending Certification they will be required to tick ERR on the Frameworks Tab before the status change will be accepted. • There is now no requirement for separate achievement evidence of ERR to be uploaded to the Evidence Tab within ACW. • The Completion Date field has been replaced by a Submission Date and this will auto populate when a learner record is changed to Pending Certification. The Submission Date will be read-only and cannot be edited by ACW users. If a claim is subsequently rejected and re-submitted, the Submission Date remains unchanged from the original date of submission. NOTE – the end date field will be removed from the bulk upload template. You will need to download the new bulk upload template form to be used from the 25th February onward. Please click here for more information. We are currently developing an approvals process for those wishing to use e-signatures and all requests that we have received so far will be dealt with as soon as possible. Anyone who would like to use e-signatures on our forms going forward and hasn’t yet contacted us should do so immediately at acw@fisss.org. As part of the Tuesday 25th February updates the Employer Details tab will now remember the employer details you enter most frequently. When adding a new apprentice typing the first 3 characters of an employer name will show a drop down of any matching employers you have previously entered. This will hopefully help users speed up the registration process and will also help to minimise errors with employer details. PLEASE NOTE: You will be expected to enter this information for all candidates at Entered or Rejected status on ACW. You will not be able to submit a candidate for certification without entering this information. Please note the following days will be counted as non-working days in the ACW system so will not be counted as days elapsed.